Look away now, PETA donors. A new, asymmetrical GTA Online Adversary Mode called Rhino Hunt went live today, pitting groups of fast, light-hitting Hunters against massive, powerful Rhinos. Which, fortunately, are tanks in this instance, so we don't have to worry about some kind of virtual "Cecil the lion" debacle. The mode is all about speed versus strength. The Hunters are equipped with sticky bombs and take to the field in nimble, lightly-armored dune buggies, while the Rhinos, working in smaller groups or even individually, are... well, big, heavy tanks, with big, heavy guns. 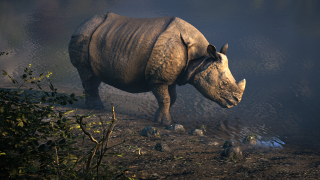 During Rhino Week, which began today and runs until March 3, players will earn double GTA$ and Reputation while playing Rhino Hunt, and also the recently-launched Til Death Do Us Part Adversary Mode and all Freemode Events. There are sales as well, including 50 percent off all automatic rifle ammunition, select weapon attachments, and all tactical gear from Heists.